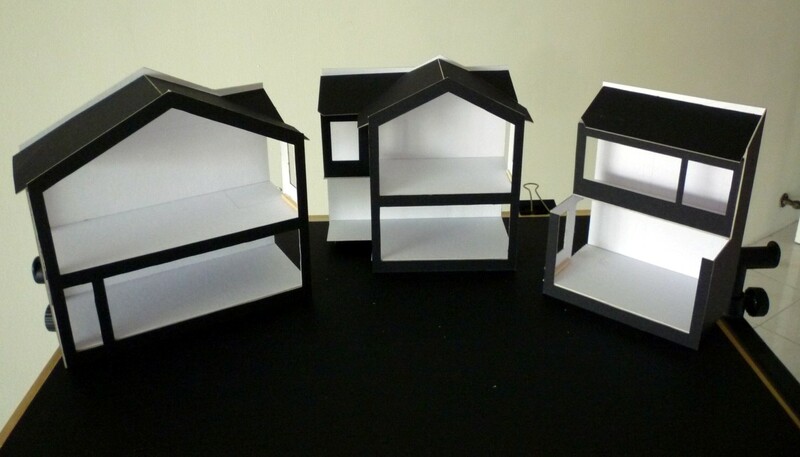 Doll House: New Project - Modular Shophouse. New Project - Modular Shophouse. The quintessentially Malaysian/Singaporean version of a shop house is a very versatile building. Can be a general goods store or a workshop or a car repair shop or a restaurant or a posh rich man's house. The ground floor can be an art gallery with the upstairs the artist's home. All these I have seen in the peninsular. The shop house is always long and thin, with air wells along it's length every 20 or 30 feet or so. Why modular? Well, I had the idea that by joining additional mid sections, you can create a house as long as you like, whilst it will always be 15 inches wide. You can also place it against a wall without losing any design detailing. The back of the model is a plain wall. The 'front' can be fitted with 'doors' with windows as can be seen on the real end-of terrace shop houses. The shortest model could be just the front, a starting point from which the model could extended. The interior can be in the modelers gift, including walls, layout etc. The card model is a proofing for the design. Detail drawings already done for the front section. But the proofing build will have to wait for our return from our NZ trip. Hopefully in April.